CGM systems are composed of three main pieces: the sensor itself, which changes glucose concentration in the body to an electrical signal; the transmitter, which conditions the signals and encodes it for wireless transmission; and the receiver, which can be a standalone unit or built right into an insulin pump, and displays the current readings and a chart of the glucose trend over the last 24 hours. The sensor is the key to the whole thing. The chemistry behind it is simple: an ultrafine gold wire is covered with glucose oxidase, an enzyme derived from the bacteria Penicillium notatum. This enzyme oxidizes glucose into D-glucono-1,5-lactone and hydrogen peroxide. The peroxide then oxidizes on the gold wire, resulting in a current proportional to the glucose concentration in the interstitial fluid. This current is read by the system and used to calculate an estimate of the blood glucose concentration based on a calibration curve. But while the chemistry is straightforward, human biology and manufacturing challenges make a practical CGM sensor difficult. 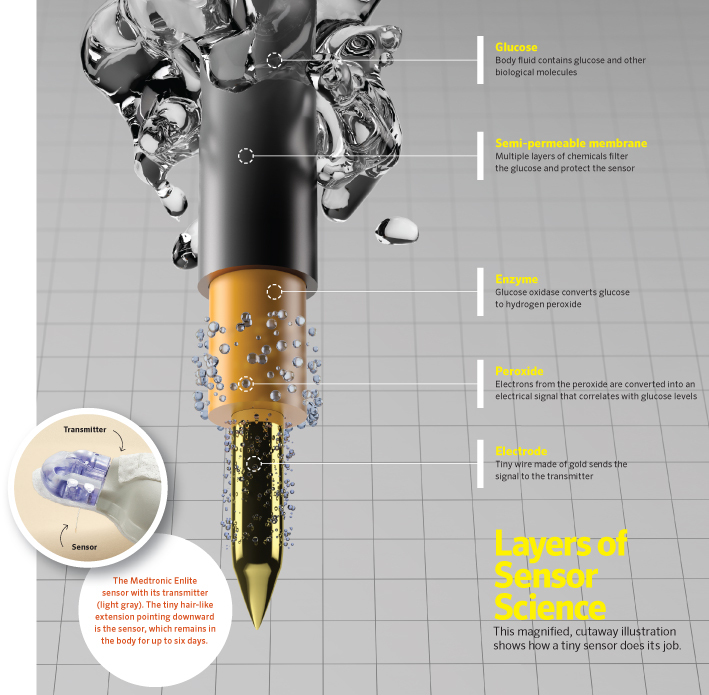 First and foremost, CGM sensors must be inserted into the interstitial fluid and live there for up to a week (although many of us stretch that out considerably to save on sensors). As a foreign object inside the body, a wire coated with proteins derived from a bacterium would be red meat to the immune system, which is designed to mop up exactly this kind of foreign invader. Without some kind of protection, the glucose oxidase that makes the sensor work would be destroyed by the immune system in a matter of hours. This requires special, proprietary coatings over the sensor that can allow glucose in but prevent the immune system from attacking the enzyme, at least for a while. The other difficulty involves handling tiny components and assembling them into an interface for the transmitter that will digitize the signals from the sensor and send them wirelessly to the receiver. The interface has to provide both a place for the transmitter to mate and a way to adhere to the skin reliably for weeks at a time without causing any kind of contact dermatitis or other side effects. The sensor also needs to be mated to some kind of introducer, a thicker hypodermic needle through which the fine, floppy sensor wire can pass, so it can be inserted without bending. The finished assembly also has to be sterilized, of course, so it has to be able to withstand the rigors of irradiation, the most common method of sterilizing medical devices. My collection of dead transmitters, including on I opened. Along with my daughter’s current transmitter, this represents about $5,000 worth of gear that insurance doesn’t pay for. All things considered, the $75 we pay for each CGM sensor probably isn’t too unreasonable. Where the value proposition starts to break down for me is the transmitters. Designs vary between manufacturers, and even within a manufacturer’s offerings as new technology supplants the older stuff. Schematics are hard to come by, of course, but the FCC ID database and a wealth of teardowns by frustrated users show that the basic guts of the transmitters we use are about what you’d expect from any wireless technology – signal conditioning for the sensor, a microcontroller, some power management stuff, and a wireless subsystem. The transmitters we’re using now use the 2.4-GHz ISM band; we’ve also used transmitters that speak Bluetooth, but those transmitters last only a quarter of the time the older ones do. $600? Really? Inside view from the FCC ID database. Looking at these teardowns, it’s hard to swallow that the $600 check I write to buy each one of these things is money well spent. We all know just how little these things actually cost to manufacture – probably far less than $5 a unit, and that’s really being generous. And yes, I know that I’m not paying for the components and the labor to put them together – I’m paying for the billions in R&D and clinical tests that it took to bring these devices to market. But I can’t help but think there has to be a better way. The basic problem is that these transmitters are sealed units. I mean really sealed – the resin capsule is injection molded completely around the PCBs, with no way to open it non-destructively. And with no way to open the case, when the batteries inside finally die, all you can do is replace it. This hasn’t kept intrepid hackers from replacing the batteries, of course; I haven’t tried yet, but it’s on my to-do list. Once the sensor is opened up it’s pretty simple to slip in new batteries, but sealing the sensor again so that it stays waterproof is a bit of a challenge. But does it have to be that way? Is it really necessary to have a relatively large, bulky transmitter like that? Seems to me that the transmitter could be much smaller and much cheaper if it used some sort of RFID technology. An external transmitter could interrogate the sensor and receive back the tiny bit of data needed to encode the current sensor voltage. 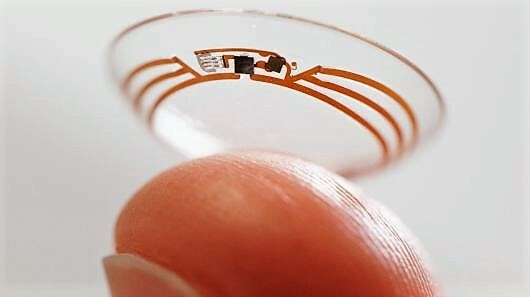 That seemed to be the way Verily, the Google-owned medical devices company, was going with their sensor-equipped contact lenses for CGM. The idea seemed solid, since glucose is excreted in tears, and results in one of the early symptoms of Type 1 diabetes onset – blurry vision dues to sugar crystals on the cornea. The contacts would certainly not have a battery on board, so it would have to be remotely powered. Sadly, though, Verily just announced they’re throwing in the towel on CGM contacts, stating that the biological hurdles to getting a stable, diagnostically useful reading were just too great to surmount. As we’ve seen, CGM is not easy, but I have a hard time believing that Verily bailed on this for purely technical reasons. With my cynical hat on, I’d say that the prospect of jumping through endless regulatory hoops was just too much for the company to bear, which is a crying shame (sorry) for such a seemingly breakthrough technology. But it’s tough to go up against established players that already have regulatory approvals and have deep pockets to boot. Still, I’m hopeful that someone will pick up the challenge of building a better CGM. It’s not bad now, and at the end of the day I’d probably do whatever I had to do to keep my kid cyborged up. It’s just a shame that the CGM companies know this, and don’t feel particularly compelled to be a little more generous on pricing for a captive market. “Captive market” is right, an uncurable illness is a gold mine to the healthcare industry. Soon someone will find the cure for consumerism. Is consumerism actually a disease? It seems similar to addiction, but is it actually an addiction to Amazon prime or is it a reaction to feeling like your life is empty? 1) Is it in the United States or another country? 2) If in the US, is that your insurance copay or out-of-pocket? Canada chiming in: $89 per sensor, not covered through my provinces’ health insurance… covered under my office’s insurance plan, thankfully. The time per sensor is depending on the country (or the local medical laws/regulations). I heard of some countries where it can only be used for 10 days. The device itself could be used longer with that battery, but the regulations usually state, that the usage time needs to be guaranteed under worst case conditions with safety, etc. Where are you able to get sensors for $25 each? Yes but the libra only replaces SOME stick testing.. you still need to calibrate, and if you’re at all brittle, like I am the sensor is often 40 or more points off actual BG levels which can cause crisis. As well the libra isn’t compatible with insulin pumps which rather defeats the purpose os having a sensor at all. Medtronic’s 670G has advanced care greatly. I was using the 570 and enlite sensor, often without good results. Sometimes more than 100 points different from finger sticks. The newer model hasn’t been more than 15 points and the sensor works to automatically adjust insiulin flow to prevent highs and lows. The Libre reader I’ve found isn’t that consistent, however, the third party xDrip+ phone app is. It still likes a calibration once a day but outperforms the official reader in my experience. There are many people using the Libre with pumps via either AndroidAPS or Loop apps on the phone which produce a closed loop system, not for everyone but a step further than the pharma’s have been able to do. ‘cept Libre is NOT continuous glucose monitoring. To the point where it isn’t legally allowed to be advertised as a CGM. But theres no alerts on the freestyle. That wont work for parents with children who are diabetics. Anything can happen while that child is sleeping and with out any alerts, you wont know what’s going on. There is alerts just not with the Freestyle meter. I currently use Glimp, and I have used Xdrip both can get live readings to other phones for parents. The trick is getting another device to read the NFC from the freestyle, which Miaomiao works good. The best part is the freestyle uses the arm which saves good realestate for my pump sites. In the US, part of the problem is that the FDA’s approval process for biosimilars (e.g. medicine produced by genetically engineered bacteria, where a “biosimilar” is the same end product but with a different heritage of bacteria producing it) is nearly as difficult as for a new drug. This keeps generics and biosimilars out of the market (as opposed to India where there are multiple competitors for insulin production). Sanofi abused loopholes in the patent system that start an automatic 2-year timer when a patent infringement challenge is filed. They filed this mere days before their patent for Lantus expired and before the competitor who had announced plans to release a competing version to the market once the patent had expired even released to market. This gave them an extra 2 years of patent exclusivity in the USA beyond expiration of the Lantus patent. Even after the competition finally entered the market, there was what amounted to a “gentleman’s agreement” to keep prices high anyway, similar to the shenanigans Lilly and Novo Nordisk played with Humalog/Novolog. “It’s exactly the same stuff just produced a cheaper way” is what brought us thalidomide. Yes we understand chirality now, but what else don’t we understand? Nit really. AFAIK The problem of thalidomide is, that it gets partially racemized in the body. So even with chiral manufacturing it would not have been safe for pregnant women. Yes thalodomide is a chiral molecule and while only one of the enantiomers causes birth defects, the body converts each enantiomer into the other, so the cheaper production was not the problem. USA just needs to bring pork insulin back in to production, you can feel the low blood sugar coming with the pork ,but I guess the pig farmers would make toooo much money? How is it not the same? This device is a sensor + data logger, where it takes readings every minute (to a max of 15 minutes, which drives the ‘arrows’ indicator) and stores data for every 15 minutes, for up to 8 hours. It uses a standard NFC IC, and when the meter (or NFC-capable cell phone) is brought in proximity, all that data is downloaded. It is very much a continuous glucose monitor (CGM), just without the live display. What’s interesting at the heart of diabetes and the associated enzyme balances is the zinc hexamer (One zinc atom binds six insulin molecules) an adaptation by mammals and most life to store insulin which has problems as it’s been disrupted by human adaptations to seriously high intakes of copper over several thousand years along with natural anti-inflammatory active compounds. IOW. Although it may be believed diabetes is incurable, the evidence of enzyme interactions and widespread copper deficiencies point to multiple equilibrium states of key metals involved in that process; copper, zinc, iron, molybdenum with layers of moderation by iodine, selenium and magnesium and oddly alcohol. Therefore it may not be incurable and could well be simple to address. Gently does it and where possible by gradual dietary changes towards fish, seaweeds and anthocyanins under medical guidance – not simple by any means. Simple and effective monitoring of glucose a great move as a start. In future with the enzymes related to zinc hexamer equilibria and other enzymes involved with immune system signalling some of which copper based we could extend monitoring to related factors also found in Alzheimer’s and cognitive decline..
I’m not saying there is nothing in what you’ve said, but it ignores the accepted view that Type 1 diabetes is an autoimmune disorder and that Alzheimer’s is a prion disorder. There is overwhelming evidence for this. Type 2 diabetes has multiple different causes and many of these often respond to lifestyle changes. Autoimmune conditions have potential causal issues in terms of immune system signalling, there are correlations in respect of endocrine function affecting immune antigen recognition. An interesting aside is the very low incidence of diabetes in locations where seafoods such as fish and wide varies of seaweeds (higher iodine/selenium) with cooking and consumption from copper bowls has not been assessed as genetic. When family members from those locations move to western countries their diabetes risk rises in accordance with degree of dietary changes notably reductions in copper, iodine and selenium. The whole arena of the two antagonist metals copper and zinc involved in immune cell function and protein binding is hugely complex but, had common factors. The fact the zinc hexamer exists at all as storage mechanism for insulin with its antagonist copper and to a lesser degree molybdenum given we are seriously deficient in both the latter two is an area of concern and worthy of detailed attention. It may be simpler than most imagine in respect of multiple homeostases. In respect of Alzheimer’s, there are many forms and prions are a normal common byproduct of protein synthesis. It should be noted the brain has a minimal immune system functioning unlike most of the body and the mechanism for prion flushing via osmosis across the blood brain barrier since the cerebral spinal fluid which bathes the brain is far below blood pressure is delicate. It should be noted increase in brain copper increases prion binding ie typical peptide sequences in prions bind strongly to copper which alters the prion’s isoelectric point and its overall electric field distribution thus increasing osmotic pressures for those prions to diffuse from CSF into the blood. In any case there is also a key receptor NMDA in the brain which fails at depleted copper levels as it becomes overstimulated ie potentially producing far more prions ostensibly needing even more copper to increase osmotic pressure and other functions. The issue of amyloid beta/tau is by no means a simple prion issue anyway but, what stands out as those with lower metalloid enzymes fare worse, check dietary information vs locations vs prevalence. Multiple Sclerosis is another issue also tied with low copper and bacterial toxins overwhelming certain immune system signalling. There is also suggestion some bacterial toxins bind to zinc hexamer in complicating immune function as some immune cells manage the hexamer. Copper is naturally antibacterial to all human pathogens and viruii whilst iron is exploited by pathogens as catalyst for food production. High iron can switch equilibria enforcing anemia until reset by copper. I find your arguments interesting – but it does not address the issue of so many in Finland with Type 1 Diabetes. They eat a lot of fish. And it totally ignores the high increase of Type 1 new to family genetic lines starting in the late 70’s traced to mutated Epstein Barr virus. Northern European lineage were especially hit hard. As far as zinc hexamers, the only real valid role hexamers play in diabetes that has been proven scientifically is that they slow down absorption of subcutaneously injected insulin significantly. Which is the whole idea behind Humalog and Novolog and why they act faster than normal human insulin when injected – the molecule has been specifically altered in such a way as to prevent hexamer formation. IIRC, the equilibrium for zinc hexamer molecules is such that it’s basically a non-issue/doesn’t play a role for insulin that is directly administered into the blood (whether that is the rare situations of IV insulin in a hospital, or natural delivery from the pancerase). Hexamers only form in significant proportion to monomers when insulin is at extremely high concentrations (such as that found in U-100 injectable insulin). There’s a bit of research in alternative injectable insulin formulations that, rather than altering the insulin molecules themselves, chelate the zinc ions to facilitate rapid absorption/inhibit hexamer formation – but as I understand it most of these approaches alter the pH of the mixture enough to cause injection site discomfort. Sorry mike but you are ignoring the fact that type 1 diabetes is an auto immune disorder. What you are saying sounds like the typical snake oil of one who is peddling it or has been conned by them. Appreciate the immune system doesn’t automatically have sustained 100% recognition equilibria at all times and can flip in and out of various states if you like. I experienced this from time to time with ankylosing spondylitis antigen HLA b27 and decades before with odd allergies all disappeared. A small dose of steroids switches immune system back. Its not a difficult out there hypothesis the immune system is triggered by any number of foreign sources to attack the cells which produce insulin or where the zinc hexamer bound to those cells flagged by the foreign substance bindings which also subject to immense variance of genetics. Also appreciate the immune cell large and may well operate without much finesse eg MS. So recognises the insulin generating cell for some reason as foreign and attacks it as a whole despite minor “error” of a small attached foreign protein. Having looked at metalloid proteins/enzymes it’s probable from what we know of bacterial toxins they can bind and trigger a normal immune response which appears as auto-immune under the general observation of the classified “Auto-Immune” if sustained, some people even diabetes doctors like the simplest easiest way out as they are not motivated to operate long in research labs exploring outside industry expectations of diagnosis histories. Given many deficient in copper and many very seriously so, it’s a no brainer to bring us back to a suitable homeostasis level of other metals too especially since copper antibacterial and zinc involved and both copper & zinc collectively involved in immune system processes and arguably signalling too. Its interesting to also consider they are coantagonists with fluctuating equilibria. No snake oil here, I achieved Curtin university qualification in food science with microbiology and distinction in food chemistry 2010 from decades before discipline in electronic engineering and concerned that on typical western diet with much processed foods we are very much deficient in copper and worse fructose (a sugar) depletes the body and brain of copper and zinc. Demographics where sugar consumption lowest, higher minerals, less food processing correlated with lowest diabetes rates of either type and you can guess not a typical western diet at all eg Okinawa. Also the crossover between types and relative severity of diabetes not well studied or information/diagnoses scant on contributory dietary factors. I would be sanding one of those down to find out how far I can take the housing down before getting into the electronics, sacrificing one, then stuffing another undamaged but minimal sized one into a 3-D printed enclosure, or small waterproof box to facilitate battery replacement in a heartbeat. This is something we’ve been doing for a while. I’ve got one on my arm right now, actually. Turns out what works best is a 3d printed basic cover and silicone to waterproof it, as the additional size from trying to waterproof it with just plastic would make it much too bulky to wear. Batteries last about 90-100 days, so it’s easier to slice the silicone seal and apply a new one than it is to fit a rechargeable battery in there. It’s been done though, with a waterproof usb port for charging. Bulkier but a semi permanent fix. You may be right on the lifespan of the battery, but the Dexcom G5 knows it has been 7 days and will not operate on that sensor for longer than that. How do you get around the receiver knowing it has been 7 days and it needs a new sensor? Please. You can use third party (open source) software like xDrip+ or Spike to talk directly to the transmitter and bypass the 7 day limit. How hard would it be to replace the primary cell with a rechargeable battery and an inductive charger coil, then re-pot the whole thing? does not make sense, will be to large/bulky, replacing the batteries is the best way to go. G5 with replaced batteries will last 12 months, that’s what I do. Sorry to hear about your daughter but it’s good that you all have a sense of humor about it. One thing you didn’t mention is how long the transmitters last. I suspect the high cost is due to not only the R&D, clinical trials and certifications, but also litigation in the event of failure (real or perceived). This may also be related to why they are not rechargeable. The longer the thing operates, the greater the chance of a failure in flash-memory, software error induced cumulative memory leaks, capacitor dielectric, etc. The battery charge provides a specific end of life before any other failure could creep in. I worked on a next gen cardiac surgery robot a year ago, and you are right for the public market. For the specific robot I was working on, the cost of clinical trial and certifications was the same as the cost of R&D and working prototypes. So, half the budget goes to “paper”. But thanks to it, you can prove that your design is as stiff as can be. Program has to be redundant (as in two programs done by two different programmers on two different chips on the same board speaking with each other which confront their results) and documented (not only code documented, we explain in great details why we use state machine, what each state does, and what happens in case of failure for each states), and proven “bug proof”. A whole panel of tools ranging from coding rules (MISRA2004 in my case), to code static and dynamic testing (the free CPP check can be used for a first primer, but honestly, you don’t go that far with it and you need to use other tools like Code Sonar or other), to unitary test (this is a pain in the donkey if your code is not clean. But if you follow strict coding rules, you can add to your Doxygen tags some testing tags to automate test to speed up things a little). All in all, you take easily three time more resource to develop the same program, and you need to do it twice. So the total cost in the end is easily 10 time more. But, really, if it’s that expansive, it’s not to pay the R&D. It’s because, as stated, it’s a niche market that can be exploited. The whole point on spending so much resources on the R&D is to have something cheap and reliable to produce. In my case, the robot was really cheaper than other ones and permits to protect surgeon from X-Ray cancer, which is nice. And the company was created by a cardiac surgeon, so the point wasn’t to make huge amount of money (like in the public market) but to give better working conditions to surgeons. I’m a student hoping to do work similar to your work on the cardiac surgery robot. Would you mind sharing the name of the company you worked for? My personal email is lytnbb at yahoo dot com. And don’t forget that R&D costs have to cover the losses on unrelated projects which never make a profit. For each success, there’s a bunch of stuff that never works. Yup, a major factor in the cost is liability (and paperwork intended to reduce liability). Transmitter lifetime for the G4 transmitters is officially six months, but typical actual usable lifetime is around a year. (Every one of my G4 transmitters has lasted a year). I think the expensive disposable transmitter is just part of Dexcom’s revenue model. Other manufacturers have transmitters that can be recharged, e.g. Medtronic Guardian 2 Link. Possible. But even cheap consumer electronic lasts more than a year if it does not get hot. Which is not possible with the tiny battery. So this is no excuse for sucking up the customers money. I can get up to 30 days from a single Dexcom sensor. The typical reason for failure is that the sensor gets detached from the skin, so this requires special care in the insertion process and additional skin glue and extra tape – opsite flexifix cut to shape is great for that. There are youtube videos showing how to do this. Even if the Dexcom officially has 7 day cycle, you can just restart the cycle in the receiver without really replacing the sensor. If he/she/it would really exist, this “god” would also at first be responsible for all the illnesses we need cures for. So nothing to thank. In never ceases to amaze me how people can go around denying the existence of original cause. It’s a fundamental concept in both science and theism. I guess they are putting all their faith in the little g god of randomness which is a thumb at the nose to causality in general…very unscientific and very ungrateful towards the universe’s true Author. There are some interesting papers about curing type one with the BCG injection. Yeah, read about that a while ago. Very interesting. Only applies to folks with relatively recent diagnosis though. I suspect it is much like a perhaps urban myth type of quote but it used to be said that half the cost of a Cessna was their insurance. With the number of parts and pieces their lawsuit exposure is pretty high and unlike cars it is not aggregated over millions of them. I suspect the cost of any implanted medical device is very much in line with that. The seller needs to have their behind covered if one of them kills or harms somebody. I have a plastic lenses in my head as a result of cataract surgery, I have the cool multifocus ones. I am sure there are some R and D costs etc, but they sell a lot of these. The thing is smaller than your fingertip and is ultra thin. I suspect they are made out of top notch plastic, but they cost about $1400 a pop. I suspect a big piece of that is their insurance. I cannot fathom them costing near that much to manufacture. Besides their insurance, CGM’s are caught up in the shell game medical companies and insurance companies play. I bought Dexcom transmitters for $600.00 cash including shipping direct from Dexcom. Later I got insurance and the same Dexcom transmitter was billed to my insurance company (by a medical equipment co.) $1,432. Qite the profit margin for something that came drop-shipped directly from Dexcom! To be clear to those reading this, the G5 transmitter is actually a pair of them in both eases, lasting 3 months each, so when you order a transmitter, they send you 2 units, which together last 6 months. Great post technically, and Type 1 diabetes needs all the media coverage it can get – its ridiculous that a cure hasn’t been found, nor better treatments. If only it got 1/10 of the research money that cancer or HIV got.. I do wish, however, that you’d left your daughter out of the post. You have just eliminated her privacy about this medical condition for life. At some point she will be be an adult, yet will not have any choice to manage who knows about it. It’s one thing to share with your trusted friends, but another to share with the public. It’s correct that there’s no cure, but the treatment of type I diabetes has improved tremendously overt the years. Back in the 1980’s it was not possible to measure glucose from blood at home, you had to measure it from urine. Urine shows only high glucose levels, not lows. Then it became possible to use test sticks to check blood glucose levels, this was slow process (and required large drops of blood from the fingertip), you had to wait for several minutes and then compare the color of the stick against a reference chart. The first electronic glucose meters used similar sticks but instead of comparing to the chart, they measured the color electronically. Over the years the glucose meters became faster and smaller, and now it takes just a few seconds and a tiny droplet of blood to make the measurement. And then there’s GCM that monitors the glucose levels constantly in real time (and requires just some occasional calibration measurements from the fingertip). Also the insulins have changed a lot. Back in the day the insulin was pretty slow (it was extracted from pig’s pancreas and had somewhat different molecular structure from human insulin), and this – combined with no instant feedback of blood glucose levels – meant that you had to follow very rigid diet and day rhythm. Always eat the same amount of food at the same time etc. to make sure that the body behaves predictably, and complete avoidance of fast carbon hydrates to prevent the blood glucose levels from rising faster than the insulin can handle. Then first came the synthetic insulins (made by genetically modified bacteria) that have the same molecular structure as human insulin, and after that human analog insulins that have a modified molecular structure that can make the effect of the insulin faster (or slower that what’s possible with old slow insulins). This allowed complete lifestyle change, it became possible to eat normally (of course you had to calculate carbon hydrate intake to know how much insulin to inject) and have much more flexible daily schedule. Along with the fast insulins and technology miniaturization it became possible to have insulin pumps. Traditionally Type I diabetes requires two kinds of insulin: slow insulin injected once per day and fast insulin injected at meal time. The problem with slow insulins is that there’s always a base level of insulin in the body that may result in low blood glucose levels if there’s e.g. additional physical activity. (But the base level is still necessary at other times, because otherwise the blood glucose levels would rise too much.) With insulin pumps just fast insulin is used, and the pump injects the insulin constantly to the body at a slow pace. The amount of injected insulin can be adjusted to follow a curve suitable for the patient, and switched off for e.g. heavy sports. At meal times the pump is programmed to inject additional doses of insulin based on carbon hydrate intake. So 30-40 years ago a diabetic had to follow a strict diet and rigid daily schedule, these days it’s possible to live a normal life with the minor inconvenience of becoming a cyborg. :) A huge improvement in treatment I’d say. He did not mention any name of the daughter. I use Freestyle Libre made by Abbot. The only issue with this is that it a NFM and you need to seipe it with theAbbot meter. But there is a NFM to Bluetooth adapter which fits on top. Then using aan Android app called xDrop with your smart phone it becomes a continuous monitor. The sensor last 15 days with this app. Need the Abbot meter to start new sensors. There are other third party apps. I do one blood priick per day to calibrate the app with a test strip meter.. There are quite a few people in the DIY community doing this sort of battery replacement with both G5 and G4 transmitters. With the G5, you can also extend their 3-month lifetime up to whenever the battery actually dies by using a DIY receiver like xDrip or Spike, if you are comfortable forgoing some of the safety limitations the manufacturer has baked into their software. For anyone else looking at this, Pete is right but the typos get in the way of a Google search I fear! That will give readings to your phone automatically every five minutes using the xDrip+ App. Facebook group LibreGeeks is helpful for more info. Besides, it operates like an sphygmomanometer, and its lousy for daily use. But, the principle could be perhaps measured by using a simple optical heart rate and oximeter, like those used with a smartwatch. The delay in measurement could be mitigated by adaptive algorithms analysing the variations through time. The promise is an non-invasive system, with already done cheap commercial hardware, requiring *only* algorithmic programming. I am working in such system for my son, that is diabetic type 1. 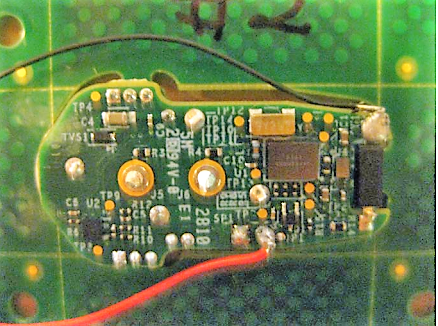 I was going to use the Omelon as “inspiration” but, despite the fact that it uses a microchip PIC24, the code is locked… So, there is a whole lot of investigative work to be done. Unless someone points to a paper about that vascular elasticity relationship with glucose. I forgot to say: “alleged” vascular elasticity relationship with glucose. You actually pointed to a confirmed and generally accepted issue in respect of proteins and sugars in food chemistry and enzyme functioning – some involve metals. There are glycation products such as where sugars/carbs bind to proteins forming a more rigid structure than either of them and making it difficult for the immune system to denature these complexes such as where their proclivity to fracture causes damage eg atherosclerosis – not found in veins only arteries in respect to of so called water hammer like fibrin tearing. Its been suggested when we are within our homeostatic level for copper and a few other metals and semi-metals these glycation products rarely form even with regular refined sugar ingestion at moderate doses. There is a compound loosely called 7/11 (beware heaps of sophisticated fakes) which breaks the protein sugar bond with negligible side effects. Tests on mice show 30% plus life extension over normal, suffice to say very hard to get this stuff. There is also a method/compound that breaks the protein/(visceral) fat bond (I discovered from post grad studies in food chemistry/microbiology) for which humans adapted to for more than 7000 years also missing in contemporary culture and not just in the first world. I’ve tried it and it works though not at all pleasant. It should be noted refined sugars in diet not natural, humans adapted to carbohydrates mainly starches as sources of glucose in that the conventional biochemical mechanism is to cleave the starch (sugar polymer) into glucose and so called ‘waste’ products. By bypassing that mechanism and the value/function of ‘waste’ equilibria for other systems all sorts of problems occur and far worse ingesting fructose without the pulp and other moderators found in fruits. ie. Fructose by itself should more likely be classed as a degenerative poison in the doses routinely available – especially since it tickles the same receptor cocaine does. The only way to clear that addiction it seems so far is cold turkey, ketosis and sizable Magnesium Phosphate supplementation minus any carbs ie only meat proteins for a few weeks – All of course must be under medical supervision precluding heart conditions, genetic factors (Eg Wilson’s), familial cancer and stroke risks etc. As before be gentle with dietary changes for the most part and appreciate western processed diet far from optimum at all – there is evidence it dulls intellect, damages neural connections between frontal/temporal lobes to limbic/amygdala regions as well as erratic glycation issues all over the body – simplest warning muscle strength variance & reduced stamina. Warning be safe do your own research don’t self medicate unless properly apprised and analysed the relevant risk factors where possible under medical supervision and verified, its your responsibility ! I’ve wondered about fasting and intellect damage causing me to be slower mentally and physically more than I used to be after performing a more aggressive ketogenic diet routine after I was found with the benzodiazapines, barbiturates and suspected opiates as well as what appeared to be high testosterone level in my system the year before I was almost assassinated. Tragedy there isn’t more thorough diagnostics performed yet routinely regarding human nutritional factors first as well as correlation with epigenomic, genomic, transcriptomic, protienomic and other metabolimic data. Edit: Entry error typo, replace “metabolimic” with “metabolomic”. Switch to Dexcom. Better technology and very affordable. I use their G6 and it is less costly for me than 10 pricks per day was. 1. Experimental methods and initial conditions. Eg Were the subjects at or near their homeostatic level of copper intake (at least) and how confirmed, only bloods or biopsies too. Any concurrent sign of anemia or in months leading up to observations, autoimmune markers eg hla b27. If no subjects then what was the origin of the biological material, tests invivo or invitro ? NB. CuZn co antagonists and antagonized by iron and lesser iodine therefore essential all be at (circulatory) homeostasis or their transport enzymes or binding proteins at least ! 2. Nature presumably ‘made’ human insulin as adaptation best fit as part of overall short term survival imperative, therefore substituting a different form not generationally tested and especially important there is no mechanism in humans to make it with the prevailing equilibrium of metalloid enzymes that go with it is an overall distraction for short term fix only. Hexamers have an adapted value, fiddling at the edges with different structures can help in short term but, no evidence its optimum to sidestepping the natural human path with all its unclear co operational factors and the most in yer face is metalloid enzymes so pick the top 3 we are all most deficient in ? We still have most people without diabetes without problems of their zinc hexamers don’t we ? 3. Under what conditions, similar to 1 re other metal homeostasis and antagonism not a one dimensional issue at all. IOW. Sidestepping homeostasis inconveniently places many types of doubt on validity on any of these observations/experiments invivo/invitro ? 4. Surely just like in engineering whether electronics through to civil, the issue of initial conditions as in biology thst permutations of homeostasis be addressed and the comparative aspects of metalloid enzymes and bioavailability antagonists be high on the agenda ? Secondary patches can help but, doesn’t address the fundamental issue ie no cure due to ignoring basic homeostasis. Humans adapted to a very different diet/activity than most westerners consume with all the foods high in sugars, low metals ffs even sugars that specifically deplete the brain (and arguably endocrine system too) of copper and zinc – imho wrong path ! This is not to suggest evolution has arrived at any optimum system – it can’t necessarily do that for short term operation as the only driver is survival long enough for viable procreation to the next cycle. Therefore extending to longer survival periods beyond first level procreation should still address homeostasis from dietary and environmental factors. Then it’s likely tuning around the edges so to speak would be far less onerous than the current paths though what has been done should still be subjected to analysis. Wouldn’t it be possible to make a detector for the compounds the dog smells/reacts to? I would much prefer a technical system than a dog. A dog needs quite an amount of care. I think the easiest way out of the $600 trap is to open one unit by slowly grinding away the plastic to remove the battery, then replace with a small rechargeable lithium polymer or super capacitor plus a small wireless charging circuit. The receiver coil can be made small. Then brush marine epoxy over it, and the unit is rechargeable using a cell phone wireless charger base. A (super) capacitor is a bad idea. It has way less capacitance than a rechargeable battery. CGM and especially non–invasive glucose monitoring has had a long history of failures. Partly because the amount of glucose in the blood is so low.. about a teaspoon full in the entire bloodstream at any given time (thats about 5ml for the average person). To make matters harder, you’re looking for a carbon-hydrogen-oxygen compound in a sea of thousands of similar compounds in far higher concentrations. This is why implantable devices are available despite the hassles/complications, simply because its the only viable alternative to pin pricks and test strips.. so far. I have seen at least 6 devices marketed, advertised, then disappear suddenly in the last decade – often because the marketting gets ahead of FDA approval/testing and it proves to be too inaccurate or too unreliable compared to the standard. Thankfully there are strict guidelines in place, otherwise the industry would be full of snake oil or products that simply can’t deliver (look how far Theranos got with funding). Also, I didn’t see mentioned in the article whether *continuous* glucose monitoring led to better outcomes for patients. It is easy to assume that more data points on a graph will lead to better monitoring and allow for more precise insulin doses, but this isn’t always the case. Take continuous blood pressure monitoring for example: It can vary a great deal and large spikes and dips can lead to over medication, when really in that case, the average is more useful. I’m not suggesting continuous measurement is worse, just that it can lead to different interpretation which can easily be assumed to lead to better outcomes, when this isn’t always the case. There is too much money to be made from diabetes to cure it. Implying that… there is a cure but its being hidden? Or that there isn’t any money going into research? I’m not sure this is the place for conspiracy theories. And I don’t think any doctor would willfully withhold treatment to make money. sensor for 27 days that was only to last 7 days before you needed to use another but someone left it in and restarted the sensor and it worked. This person then shared what they had found out with others and the amount of sensors getting ordered fell. 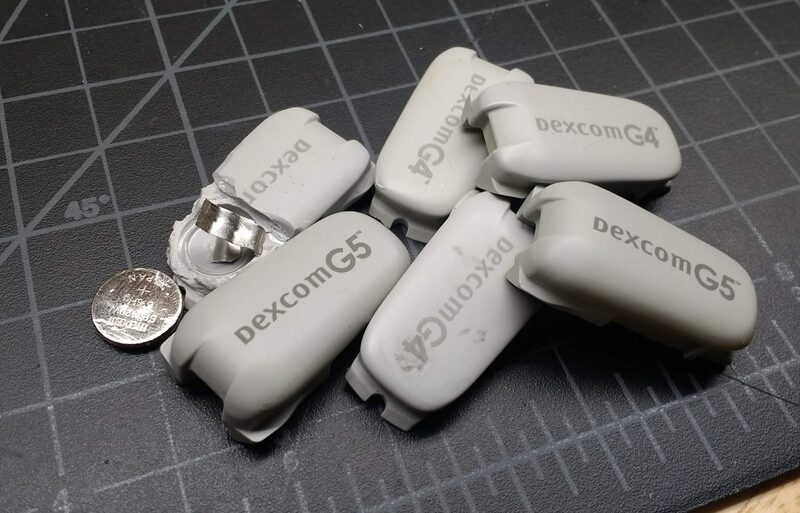 So Dexcom came out with the G4 but when people started swapping out the batteries Dexcom put out the G5 that had a built it count down that stopped you from being able to restart the sensor. Abbott releases the Freestyle Libre 14 day sensor and meter that uses encryption that stops third party apps from being able to read the sensor data. Why? So that they Abbott can be the only ones to provide the devices to read their sensors. So until someone hacks or reverse engineer the encryption Abbott is the only one that can provided devices or apps that can be used. So after reading all this you think that they are working on a cure then you need to start looking at what is going on around you in the world. Check http://www.jobst-technologies.com for a reliable glucose sensor that will last more than 100 days. You are totally right, saying that the price is higher than it should be. In UK those transmitters cost about £200 each. Even though I miss a lot living in Italy: I do not even know how much this stuff cost there, because I had it all for free. In the area I am from (Tuscany) I did not even have to meet criteria or anything to get it. It was like: “oh, you’re T1? So here it is: your insulin, your strips, your pump, and your Dexcom”. That was awesome. By the way, I also think that we’d easily have the technology to get much better CGM (more reliable, more performing, etc). But the audience for these devices is not big enough to justify investments from companies to make them better, and competition is not that much. So the technological advancement are not going at the speed they technically could, in my opinion. Have you seen the Abbott Freestyle Libre Flash sensor system? The sensor cost about US$40 each in USA and last 15 days. You can hack them by using a Ambrosia Bluecon Bluetooth adapter on top which talks to a the xDrip app on an Android phone. xDrip / Bluecon makes the Libre Flash swipe sensor into a CGM. You can also / should calibrate the xDrip readings against a blood test strip finger test blood sample on a daily basis. Not the new Abbott Freestyle Libre 14 day Flash sensor system. I got mine 3 weeks ago and tried using xDrip it did not work. I then tried Glimp and it didn’t work then saw were Glimp said it was due to Abbott encrypting the data and until they figure it out there is nothing that they can do. So the Abbott 10 day sensors will be discontinued and they will give you a free 14 day reader to replace your 10 day reader. Which is going to piss off a lot of people who have been using Ambrosia Bluecon Bluetooth adapter, MiaoMiao and other apps to read their sensors.